class="post-template-default single single-post postid-332879 single-format-standard custom-background group-blog header-image full-width singular wpb-js-composer js-comp-ver-5.7 vc_responsive"
Mid-Plains Community College nursing students Ashley Barnhart, Jordan Goodell and Sammie Gutherless, all of North Platte, put the skills they learned in the classroom into practice Wednesday. MPCC has expanded its Associate Degree Nursing program to counteract the nursing shortage within its service area. 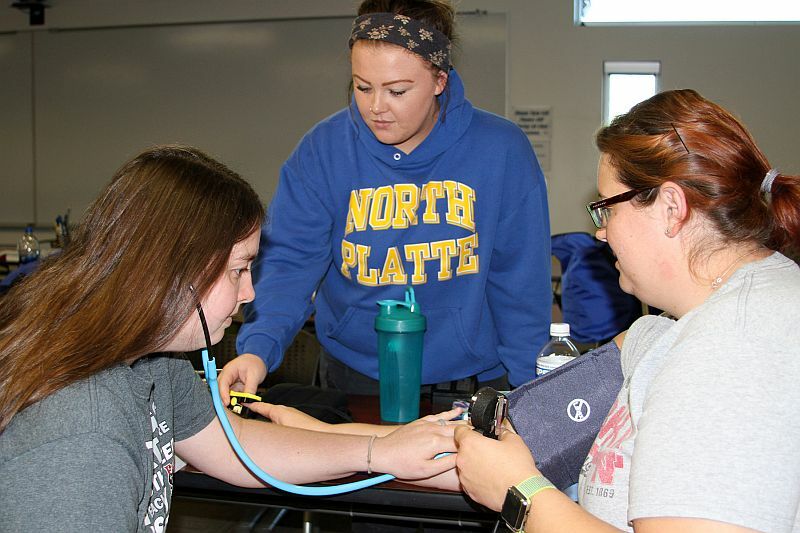 Mid-Plains Community College has expanded its Associate Degree Nursing program in response to the nursing shortage happening both regionally and across the country. A total of 32 students were admitted to the ADN program this semester as compared to 24 in the past. Another eight Licensed Practical Nursing students will bridge in come March – for a graduating class of 40 in 2020. A report from Economic Modeling Specialists International (EMSI) shows there were 907 registered nurse positions open in MPCC’s service area this year. That figure is anticipated to jump to 976 by 2023 due in part to an increased emphasis on preventive care, growing rates of chronic conditions and demand for health care services from baby boomers. EMSI lists the median earnings for registered nurses in MPCC’s service area as $29.52 per hour. The acceptance of more students into the ADN program at Mid-Plains means those currently residing in MPCC’s service area can stay close to home while training for a lucrative career. From the student perspective, the ADN program at Mid-Plains will remain relatively unchanged aside from adding more seats. The curriculum is the same as is the eight-to-one student-to-faculty ratio in the clinical area, thanks to the hiring of Alma native Addie Schaeffer as a new nursing instructor.